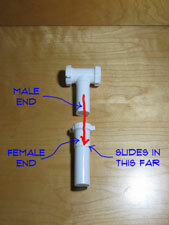 Knowing how to cut pvc pipe is useful knowledge that will be needed for many plumbing repair projects. The pipe is made of plastic and cuts easily. The trick is getting it the righ length. For related information see the articles, 'Sink Drain Plumbing Repair', 'Identifying Sink Drain Plumbing Parts', 'Installing a Sink Drain' and 'Troubleshooting Plumbing Pipes'. Cutting sink drain pipes is not difficult. Especially if you go with the less expensive pvc plastic pipes. PVC pipe comes in several different types. The most common varieties are for interior and exterior drains and residential water piping. Depending on the usage, the pipe can be different colors. Exterior drainage pipe is usually green. However, there is no completely standard coloring system and the use of colors has evolved over time. For interior drain pipes, it is usually white. The white color can also apply to sink drain plumbing fittings. White can also be used for water supply lines. For sink drains the fittings are mostly compression type. Meaning that they do not get glued together, instead a nut and washer is used to stop the fitting from leaking. The other type of pvc pipe is for glued connections. Notice the fittings fit inside one another. So the fittings that slip together have either a male or female end. Some ends are threaded to mate up with a matching piece, like the P Trap. Due to this feature you will have to allow for the overlap when you measure your pieces. You can tell on the outside of the female piece how far in the other piece will slide in. Mark the piece you are cutting accordingly. Your use a hack saw to cut the pipe whether it is metal or plastic. The cuts do not have to be perfect due to the overlap. Dry fit the pieces to make sure the are fitting correctly. The piece of drain pipe that goes into the wall will also be cut long. It will go inside the pipe a couple of inches and be held in place by the nut and washer.